Montine McNulty, longtime director of the Arkansas Hospitality Association. Like a chef at a popular restaurant, Montine McNulty is serving up dishes of hospitality that have resulted in more jobs, surging tax collections, and most importantly a contribution to the quality of life that will make her job tenure a part of Arkansas heritage. McNulty is the longtime director of the Arkansas Hospitality Association, an industry umbrella for restaurants, lodging, travel, tourism and festivals in the Natural State. At the state legislature, she wields powerful influence with an industry that has seen 23% job growth over the past decade. She’s equally comfortable in a down-home restaurant setting or the marble corridors of the Capitol for a conversation about the hospitality industry’s past, present and future. Tourism and hospitality, the sectors of the economy that capture restaurant and food services activity, has been on a tear since the Great Recession pinched everyone’s pocketbooks. In the near decade since, jobs have grown from 97,900 in 2009 to 120,500 at the end of 2018, and the state’s 2% tourism tax collected $16.43 million in 2018 versus $11.38 million in 2009. “It’s what I hoped for 10 years ago, but I can tell you that it has taken a lot of leadership on all levels to make it happen. That’s the exciting thing that has driven this,” she said. The leaders of Northwest Arkansas have been on a mission to establish the area as a major culinary destination not just in-state or regionally, but nationally, if not internationally. There is the Brightwater: A Center for the Study of Food — the culinary school operated by NorthWest Arkansas Community College — and 8th Street Market in Bentonville, both of which are destinations for foodies and craft beer lovers. Fayetteville, Rogers, Springdale and Bentonville all have thriving farmers markets. There is a new breed of locally-owned restaurants and local chefs helping fuel downtown hot spots across Northwest Arkansas — all of which are bringing press attention for their efforts. And of course, the farm-to-table movement can be witnessed prominently in the region from the first agrihood development, Red Barn, to others pushing the limits with fresh, local ingredients. Hospitality and tourism job growth in Benton and Washington counties is up 48% since 2010, from 18,150 jobs to 26,800 jobs last year. Tourism tax collections accounted for more than $11 million in NWA’s four largest cities in 2018, roughly two-thirds of the state’s total collections. Local food and lodging taxes in Bentonville, Eureka Springs, Fayetteville, Rogers and Springdale totaled more than $12.6 million in 2018, up 6% over last year. McNulty said the state and nation recognize what is trending in Northwest Arkansas, which she says set a goal nearly a decade ago of attaining the attention it’s receiving. She credits the leadership in and out of the industry for the push and success. She also says lifestyle trends and population growth are fueling the surge. At the state Capitol, there is recognition of the value of the industry to the Arkansas economy. Jobs, quality of life and tax revenue have earned the hospitality industry a proverbial seat at the table. But it’s not all accolades. McNulty and industry leaders have played offense and defense on a number of legislative measures that have earned them compliments and criticism. The state’s minimum wage law is one area. Voters overwhelmingly approved a stair-step increase in the minimum wage from $9.25 per hour this year to $11 per hour by 2021. McNulty contends that will lead to expenses that will diminish opportunities in an industry dependent on younger and first-time workers, while complicating bottom line profits for business owners who already just eke out a living. After a full-scale effort to carve out exemptions stalled, McNulty has advocated for an exemption to existing law that would affect workers under the age of 20. “We want young people that have fewer skills and less education to be able to get jobs. And they might not get jobs,” she warns if restaurant and lodging employers can’t afford the help. McNulty has curiously spent a lot of time in the current legislative session in the education committees at both ends of the Capitol. Efforts to alter school start dates have a significant impact on her industry’s business owners. In previous sessions, as the start date inches back into the summer, it has led to difficulties attracting younger workers for what was considered a full summer’s work. She thinks a compromise bill among hospitality leaders, teachers and school administrators will resolve the issue. Other battles she is encountering this session include efforts to require establishments that serve alcohol to post notices about fetal alcohol poisoning, ending gun-free zones at entertainment and fair venues, and workforce funding. McNulty sees no signs of a slowdown for the industry. “I got something last week from the National Restaurant Association. It’s a state-by-state projection, and Arkansas is projected to grow by 9% over the next four or five years,” she noted. She sees more national chains expanding into Arkansas, as well as independent restaurateurs opening up for business. In the age of travel, recreation and active lifestyles, McNulty sees the restaurant business as providing a boon for large and small towns. While a factory may not locate in every community in Arkansas, the experience of food and the stories behind what’s on the plate is an appealing one to many travelers, whether they come by car, bike or motorcycle. McNulty says the experiential business of food can be located anywhere, and that may turn out to be a salvation for many smaller communities struggling to create jobs and local economic activity. “I think we’re going to see more of that, and they’re going to be very successful. 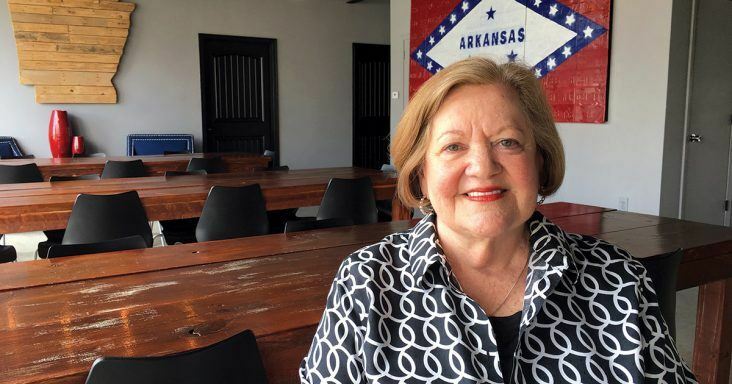 I think the doors are wide open for more culinary and good food in Arkansas,” she said.